Not only can you leave bids or bid live on our Auction App and receive a lower bidder’s premium than on other bidding platforms, but you can also see the results of our previous sales. Although currently only the auctions since October 2016 are displayed, we will be adding the results of our prior sales. 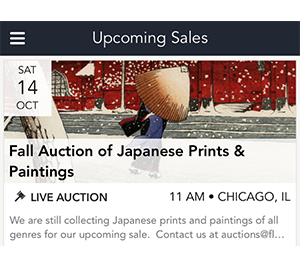 Our Auction App is available free at the iTunes Store or Google Play.